Many area experts say that two bathroom trends are popular. Most popular is the embracing of zen-like spa spaces, but there is also a growing interest in bolder colors, whether they are found in vanities, paint, tile, or accents. Billy Toungette of Ferguson Bath, Kitchen & Lighting also reports the biggest trend in bathroom design is transforming the master bathroom into a spa getaway. “The incorporation of luxurious pieces, such as freestanding tubs, digital showering systems, and bidets, help create relaxing experiences in the bathroom,” he says. When it comes to bathroom trends, ample storage space comes to mind, according to Albright. “That alone is a common trend among many homeowners. They like products like Kohler’s Tailored Vanity Collection and accessories that provide personalized storage and the option to add in-storage drawers, custom electrical outlet hardware, or coordinating medicine cabinets,” she says. Cabinet accessories can include electrical shelves, roll-out trays, make-up storage trays, roll-out appliance storage, and more. Anderson also reports seeing a growing use of bold color and wallpaper, especially in powder rooms. At the same time, she reports seeing use of wide plank bleached flooring in bathrooms for a beachy house vibe. “Matched with dark floating cabinets the look is sleek and modern with a touch of drama,” she says. Albright says she’s noted the growing popularity of matte black plumbing fixtures and contrasting them with white walls and countertops. “Today’s bathrooms are getting a lot of stylish upgrades like subway tile, deluxe showers with control panels, and smart technology – like Bluetooth devices and wireless speakers, to name a few,” she says. PDI’s line of Native Trails free-standing tubs in bold finishes such as polished copper and slate can easily become the focal point of any bath space. “While we see a large influx of color tile, wallpaper, and paint,” Fudim says, “we’ve also seen a lot of color in hardware and faucets. Black and gold have the timeless appeal, while brushed nickel and polished chrome are classic as well.” She adds that Beth Haley Design has seen an uptick in clients interested in green, sustainable materials. Albright says Kohler offers a wide array of WaterSense labeled High-Efficiency Toilets (HET), among other efficient products, that can save a family of four up to 16,500 gallons of water annually. 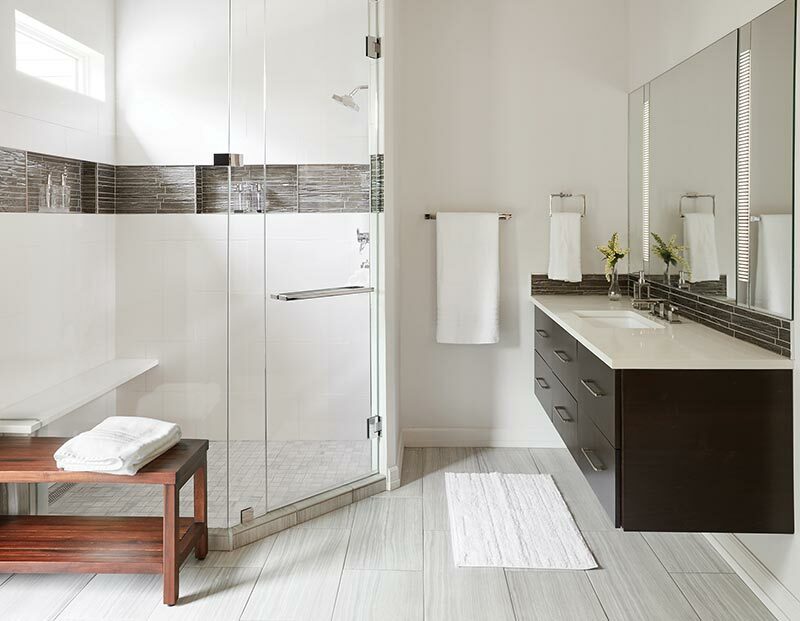 One of the top bathroom trends is monochromatic style. A small space, bathrooms give homeowners the opportunity to experiment with unique style and design. Monochrome makes design easy—choose one color and decorate with different shades and the result will be a clean and minimalist look with a little shine from accessories and fixtures. 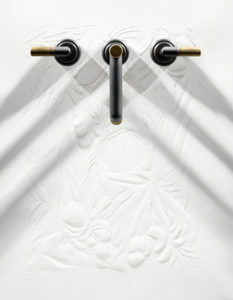 Several sources mention the addition of high tech in the bathroom, particularly in the area of lighting and showering. “We’re seeing a growing trend from manufacturers to incorporate dimmable LED lighting into the edges of the mirror,” says Toungette. 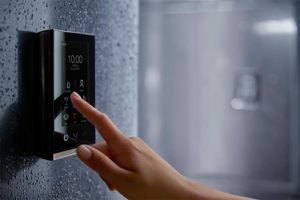 In addition, digital showering systems allow homeowners to turn a routine shower into a personalized hydro-therapy experience with the help of a digital interface system. Functioning as a remote control, the digital display allows homeowners to save their favorite temperatures and showerhead combinations, as well as play music from a handheld device like a smartphone. Homeowners can also incorporate smart technology in their bathroom with the new Verdera Voice Lighted Mirror, according to Albright. “It uses Amazon Alexa to control your lighting, included Kohler Konnect features, and more,” she says. In other words, know what you want, understand your space and potential materials, and how space will be used—then allow your design choices to become clear.